Welcome to your top source for Oasis at West Villages real estate and the newest Venice home listings. Oasis at West Villages is centrally located to Venice, North Port, and Sarasota. The community features large homes with 60-70 foot wide home sites nestled against a nature reserve. Local Gulf of Mexico beaches is just minutes away from where this gated community is situated, providing endless opportunities for beaching, boating, and fishing. To receive more information about the homes or condos in Oasis or to schedule a private showing, contact our local Oasis real estate agents today. Are you ready to buy or sell a home in Oasis at West Villages? Call your local Oasis real estate team, PROGRAM Realty at (941) 999-9900, for comprehensive help in the Oasis real estate market in Venice. Homes in the Oasis community are inspired by the nearby nature reserve. Homes range in square footage from 2,100 square feet to 4,000 square feet. Homes sites are 60-70 feet wide and homes can be one to two stories tall. Homes feature 3 to 5 bedrooms and 2.5 to 4 bathrooms. Outdoor living includes a community pool, hiking, and walking trails as well as tranquil ponds. Offsite amenities include local access to beaches in the Gulf of Mexico, an upcoming Atlanta Braves Spring Training Stadium, unique restaurants, and shopping. There are championship golf courses nearby and endless opportunities for fun in the sun. Oasis amenities include a clubhouse as well as an exquisite, spa-like pool. This neighborhood is within walking distance to the Myakka River and directly across from The State College of Florida. It is in close proximity to downtown Venice and Sharky’s on the Pier. Myakka Pines Golf Club and Plantation Golf and Country Club are just minutes away. Oasis is just a few miles from Manasota Key Beaches where there are gorgeous sunsets and plenty of opportunity for swimming, boating, and fishing. This community boasts tropical elegance at its finest! 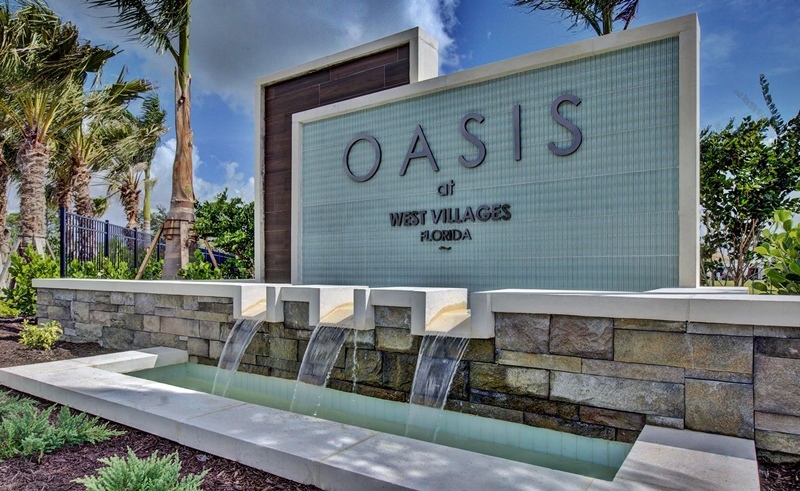 Are you looking to buy or sell a home in Oasis at West Villages? Our Venice real estate agents are ready to help guide you through the process of buying a home in the Oasis gated community. We have the expert knowledge of the market dynamics that are unique to the Oasis real estate market. We are here to help! For More Info On Oasis Contact Us!